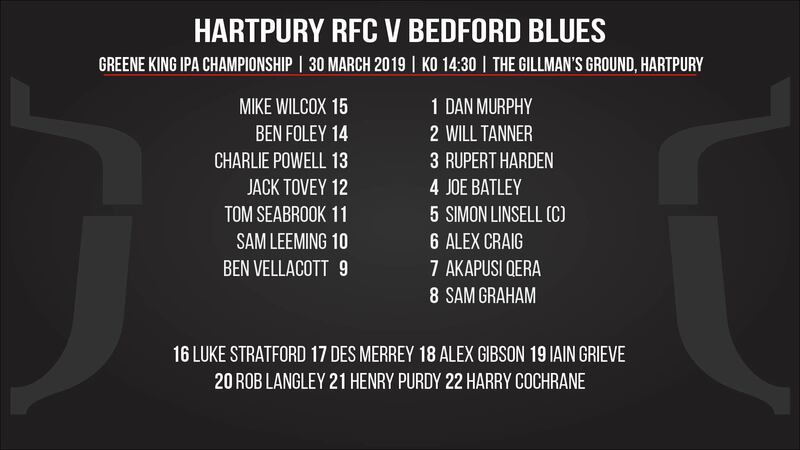 Despite the competing attentions of the Premier Shield, Hartpury have managed to stay strong in their selection for tomorrow’s hugely important home game against high-flyers, Bedford Blues. They have kept the core of the side that did so well in Jersey last weekend and have made one or two additions that should keep the management and coaches happy. Back into the team comes Hartpury graduate and Master’s student, Ben Vellacott, at scrum half. Harry Cochrane, voted man of the match last weekend, moves to the bench, as Hartpury simply cannot overlook a player of Vellacott’s talent to put up against former England man, Lee Dickson. Also returning to his former ‘home’ is another Hartpury product, lock forward Joe Batley, now of Bristol Bears, who will line up alongside skipper Simon Linsell in the engine room. Alex Craig will therefore switch to the blindside of the scrum to form a powerful-looking trio with Fijian legend Akapusi Qera and another talented youngster, Sam Graham. The front row remains unchanged and it is also ‘as you were’ in the back division, meaning that Sam Leeming – another hero of Jersey – continues at 10. Hartpury have power and pace in abundance on the bench where Cochrane – who can also operate on the wing – is joined by Gloucester speedster, Henry Purdy, making his second appearance for the club. Alex Gibson, who played in Hartpury’s BUCS Super Rugby semi-final victory over Bath on Wednesday night, provides front row cover along with Luke Stratford and Des Merrey.